Click on the links below to go to the recommended websites for this book. For links to more language activities and resources, click on / Foreign languages / in the menu at the top of this page then click on "French". Explore a map of the EU and find facts about France and other countries of the EU. The audio clips need Flash to play and may not work on all browsers. 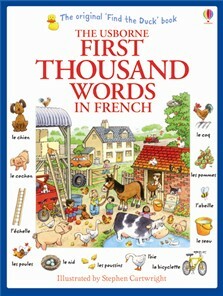 Those learning French will have great fun spotting and memorising one thousand French words in this classic word book. Each scene features colourful illustrations by the much-loved Stephen Cartwright, including a Little Yellow Duck to spot on every page. Readers can listen to every word read by a native French speaker at the Usborne Quicklinks Website. Words are divided into themes including ‘At Home’, ‘Actions’ , ‘Food’ and ‘Colours’. A fun way to learn key French vocabulary. Parents keen to get their little ones learning the lingo before they go to France will love First Thousand Words in French. This French bilingual word book is divided into themes and includes beautiful illustrations, which makes it an effective resource for helping children to learn everyday French vocabulary.